Q: Why use metal motors? Would it be better, if you use plastic bottles for the body of the water-rocket? A: Metal rocket motors have been a part of my water rocket experience ever since my father and I built them in the early 1960s. In later years they represented "extreme water rocketry" and appealed to our sense of adventure. The element of danger was significant, and exciting, but a definite concern. I certainly don't think others should adopt the techniques presented here for using metal motors. It is just too dangerous, and I have stopped making them. You are right, using plastic motors has many great benefits even beyond safety. Most importantly, the performance can be good without using metal motors. Hey, and they don't corrode! There is plenty of adventure and excitement for rocket scientists of all ages using plastic bottles. 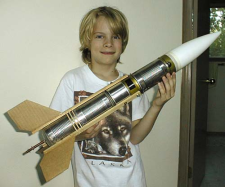 The new www.water-rockets.com website is all about building and exploring plastic bottle rockets that meet the safety code.